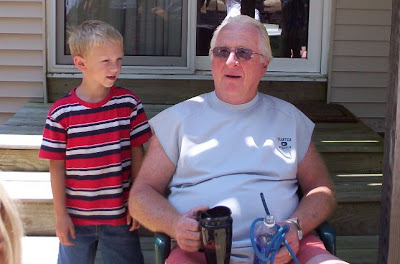 Here is a 'Twofer' photo - Uncle Ray and my nephew, Timmy. Kids loved Uncle Ray, and he always spoke kindly to them and never lost his temper other than to banish them to the basement or outdoors. He'd let some of the many cousins or grandchildren (who were always around in the summer or fall) ride in his pickup truck to the store or the landfill (to 'help'), making them feel special and important. He'd put them to work (some enjoyed this, some not!) on the woodpile or various chores. Especially at the holidays (but pretty much anytime), Ray and Mary Ann would have guests. No one could have more generous hearts! Ray and Mary Ann embraced and encouraged a continuous stream of visitors, meals in and out, coffee brewing, bathroom occupants, luggage, and trips to the airport. The various cousins, nieces, nephews, friends, children and grandchildren would slumber in sleeping bags on the floor, on sofas, and pretty much anywhere they could 'alight'. Aunt Nancy loved to be in this group because they'd stay up half the night talking and laughing. Pretty nice people, wouldn't you say? I'd say - the BEST! 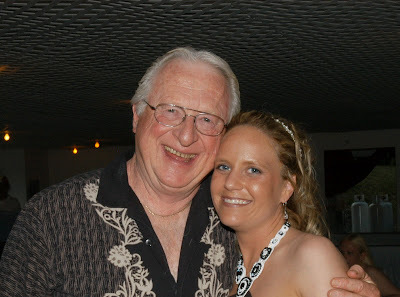 If you haven't read the blog since Friday, my Uncle Ray passed away on Friday morning. The entire family, as well as several townships in Maine are keenly feeling his loss. He loved to laugh and joke and tease, and was responsible for the match making of at least two couples in the family. However, Ray worked hard! If you stayed up at 'Ray and Mary Anns' during Thanksgiving week, you'd be stacking wood for sure. He would tell wonderful stories in his deep and unmistakable voice. We listened to stories of wildlife viewing of moose and deer, county fair stories, racing stories - stories of all kinds! I was there one day when a telemarketer called. Instead of hanging up or getting angry - Ray launched into a narrative that included a history of his life and tidbits from the last 50 years or more. I think the telemarketer finally gave up! Impressive, to out-market the telemarketer. Telling that story made me smile - and that's what I want to do, whenever I remember Uncle Ray. Day 1225 - Missing you, Ray! 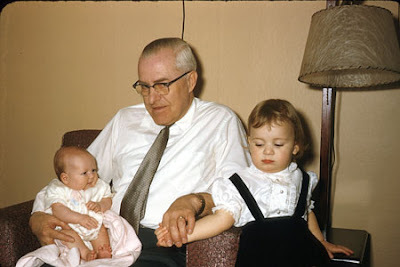 I found this wonderful photo of Uncle Ray and Heather for today's blog. Heather has a story about Uncle Ray taking her to the neighbors farm to see a new litter of kittens. Heather was very young at the time. They decided on one to keep, and he let Heather name it. (This was such a kind and special thing to do, and we've never forgotten it.) Heather chose the name 'Sunshine', which was just a perfect name for an orange tabby. Speaking of stories, here is the news story in the Lewiston Sun journal yesterday. It is a very good article. Charlie and I are leaving soon for the health club, then a visit to Cajun Steamer with Buddy Joe. Have a nice Sunday, everyone, and remember that it is fond memories that keep our loved ones alive in our minds and hearts. Yesterday, we lost a very close and beloved member of the family, my uncle Ray, in an accident while he was exercising a horse. 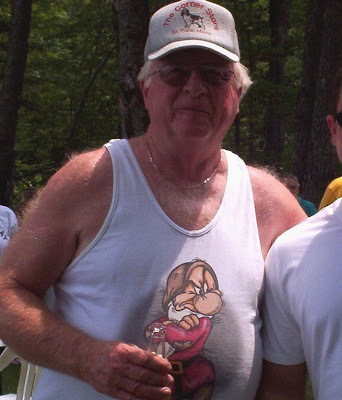 Here is his photo from one of our past family reunions in July. Ray was a great father, a great husband, a great uncle, and a great friend. Ray and my Aunt Mary Ann hosted a foreign exchange student from Paraguay who is still like a member of the family. My brother lived with them his senior year of high school and loved every minute of it. Ray was also a veteran of the Vietnam war. He battled leg and vein issues for decades that only recently were able to heal - a result of wounds incurred during his service. I can hear his voice answering the phone, saying 'Top of the Mountain', in his strong Maine accent. When he said 'Well, how are ya?' it would sound like 'Wella-WAY-yuh'. Ray was retired, but he kept busy! He chopped wood, gardened, brewed beer, fed the birds, mowed grass, watched the wildlife, plowed the snow, hunted, and traveled and a million other things. He also raced stock cars in years past, he loved racing and had many trophies. Ray also loved a good joke, a good laugh, good friends and good food. And don't forget frogs! We will miss him SO much, but he left us with so many good memories. 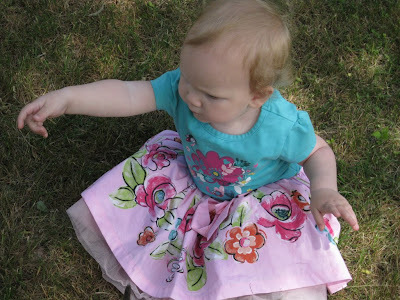 Here's Miss Savannah, princess of the outdoors... Nice photos, Heather! I got the one you sent to me on my phone. If you haven't heard the news, Ed McMahon, Farrah Fawcett and Michael Jackson all passed away this week. I am sure the media will have a lot to say, to the nth degree. I also read something that implied Michael Jackson had cancer, but I am sure we'll hear everything there is to hear over the next few days. Greetings, Bloggy Ice Cream Lovers! 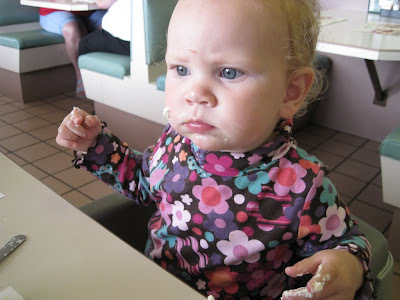 Here is Savannah enjoying the ice cream parlor - and wearing some whipped cream. It looks like it could be a Friendly's or Newport Creamery. Where did you go, Heather? She is VERY focused on that dessert! Changing subjects - I forgot to say 'Happy Summer' a few days ago, and now the days are going to start getting shorter! I also keep forgetting to tell that I saw a new batch of colts down at my favorite horse farm I pass on my way to work. I didn't see any white ones this year, but I think I saw a set of twins. Very sweet! I was wondering if they had ANY colts this year, because I hadn't seen them yet this spring. Hope you have a nice Thursday, and TTFN! Heather, I just love this photo - so colorful and cute! Nice Jammies, too! 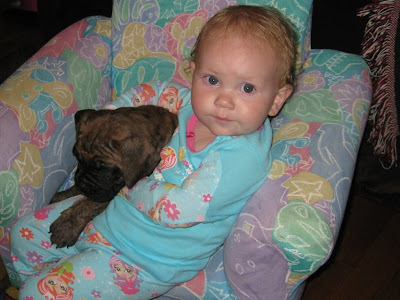 Everything is 'kid-sized' - the chair, Savannah, and the puppy. Are the characters on her pajamas the 'Bratz'? I don't know all the modern ones except Dora and Ninja Turtles! Fourth of July is rapidly approaching, we don't have any big plans yet, maybe go to Amish country or something like that. Hey - I am running late (I keep getting distracted and have changed shirts three times), so I'd better go! 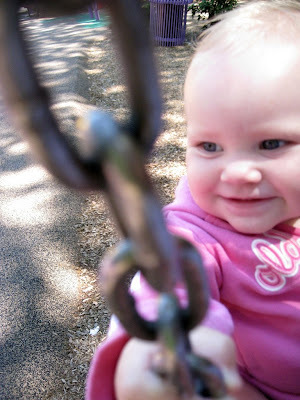 Here's a sweet picture of Miss Savannah on a swing. Isn't that a great expression? What a sweet smile! I don't know why it's so fun to swing, but it is! Kind of an enhanced rocking chair. 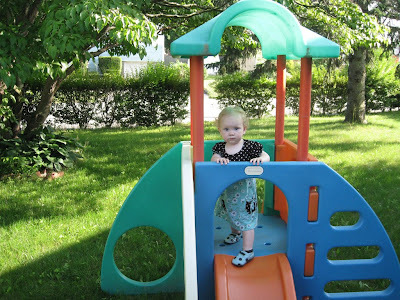 They have to build swingsets strong, because kids stand on the swings, sit on the swings, lay down over the swings, and ride sidesaddle on swings. As well as doubling up on the swings. At least, I did! My sister and I would face each other, riding sidesaddle on two swings. We'd get going sideways, and crash into each other like battering rams over and over, just for 'fun'. Was that fun? I guess! Eeek! It's 6:10 - I'm running a little late this morning. Day 1219 - Fathers Day Plus One! 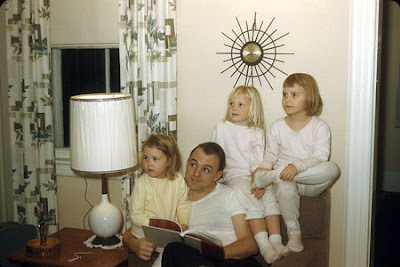 I can't resist posting one more Fathers Day photo, although I probably have posted this in a previous blog. Here is my father (lower right) with myself (upper left), Marcia (upper right), and Lyn (lower left). Mom, why is the plastic still on the lampshade? This is one of my favorite pictures, and 'girl power' is well represented. Yesterday Charlie and I went to see the remake of 'Pelham 1-2-3'. We enjoyed it! It was worth the price of a matinee, and there were some funny lines and very 'New York centric' dialogue. Speaking of funny lines - I'm going to tattle on Charlie. Nashville set a record for the hottest morning temperature yesterday, the low temperature was 79 degrees. Too bloody hot. We remarked about how hot it was on our way into the health club. Charlie quipped 'Put a little sand up your crack, and it would feel just like Florida!' Thanks, Charlie! Suggestion noted. HAHAHAHA! Day 1218 - Happy Fathers Day, Dads! Greetings, Bloggy Fathers and Grandfathers! Here is a great photo of my paternal grandfather, Ed. 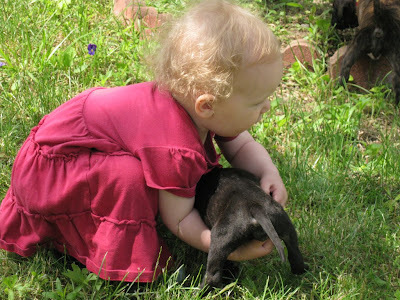 I am the baby in the photo, and Marcia is the toddler. We have already been up for a while, and I made a bacon, egg and toast breakfast for Charlie this morning. I used organic eggs that I traded a lady at work for - a jar of jam for a dozen organic eggs. Next, we are off to the health club. Then to Dicks Sporting goods so Charlie can spend a Fathers Day gift card he received. Then maybe to a movie later? We'll see! We are having one scorching hot day after another. By 10 or 11am it is too hot to be outside, and no sign of rain. Stay cool, and have a wonderful Fathers Day! Greetings, Bloggy Father's Day Wanna-be's! Ahhhhh - the weekend is here! This is a great picture, Heather! Charlie went out to his daughter and son-in-laws yesterday and mowed their yard for them. What a nice Fathers Day gift! When they got home, they started calling people to try to figure out WHO did it and WHO to thank! What a nice surprise, Charlie! Great idea! Sorry about no bloggage yesterday, Blogspot was not up at all when I am normally writing it. I don't know why. I used that time to order 2 things from Ebay.... Oops - shouldn't have told that. I'll be leaving in 15 minutes for water aerobics class. We are expecting 95 degrees with a heat index of 102 today. Blech. However, I've heard that New England's had too much rain lately and could use some sunshine. Have a nice weekend, wet, dry or HOT! TTFN! 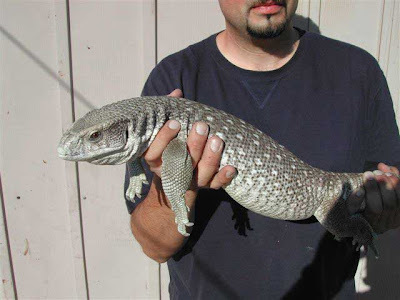 Heather - this is a 'Savannah Monitor' - did your 'lizard visitor' look like this one? Too funny! Well, the week is flying by. It is expected to be 95 degrees today, and the next day, and the next day... Too hot for me. The tops of shampoo and conditioner bottles don't unscrew easily anymore. Do you bother trying to get all the conditioner out of the bottle, or do you just throw the bottle away and move on? I spent $11 yesterday on two big bottles of conditioner, so I threw away my super-sized old bottle without trying to wring every last bit out of it. Of course, I felt wasteful and guilty. One funny - 'free' with one of my bottles of conditioner was a smaller bottle of 'deep fortifying treatment'. But what did they name it? Fortifying Fortifier. What a stupid name! Can't a marketing department come up with something better than 'Fortifying Fortifier'? Sheesh. 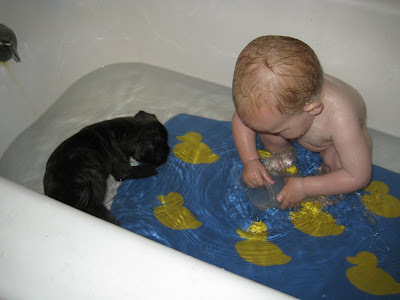 Look - Savi has a new tub toy! That picture is priceless. I like the duck mat too. I went to the car dealership after work yesterday for my 35,000 mile service, which is just an oil change. They told me I'll need new tires in the next 5K miles or so. Can you believe that? The car just turned two years old, and I'll be needing to buy tires. Anyway - I guess that means the tire life of those tires is around 40K miles. The service guy then told me my brakes were good. He asked me if I'd already had them replaced! I said no, and he said 'well you must not use them very often!' Ha ha! So - now I have something to think about - what tires to get. I know I'll get top of the line Michelins, but WHERE to get them? Sams Club? Costco? Tire dealer? Here is Miss Savannah, picking up a puppy. Or, kind of picking up a puppy. It'll be heads down once she gets the puppy off the ground! So - Monday is done and the rest of the week is downhill from here. I went to the health club yesterday, got in a 45 minute workout, then everyone had to leave the pool due to thunderstorms coming in. I drove home in just a little rain and occasional lightning, but our cable was off and on yesterday evening, and the cable internet wasn't working either. At one point - the TV sound feed and the picture feed were out of synch, and it looked like a weird foreign movie because the actors mouths would move at a different pace than the words! I'm running a tad late so I'll make this short. Day 1212 - does it have any mystical significance? Wiki answers - NO. Drat. 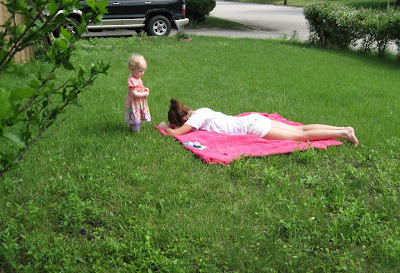 This picture would have been perfect for the blog where I talked about sunbathing, and how it is perceived by young children. Well, it's the start of a new work week, and we had a nice weekend and I caught up on grocery shopping (though I forgot milk) and laundry. Charlie and I went to see 'Terminator' yesterday. I enjoyed it, but it was a two hour movie with a LOT of effects and explosions, but pretty light on plot and acting. Maybe a B-. Oops - it's after 6, I'd better get going! TTFN and have a nice Monday! Day 1211 - Sunday already! Church sign of the week - 'If you stand for nothing, you will fall for anything'. Here is Miss Savannah sitting in a swarm of puppies. 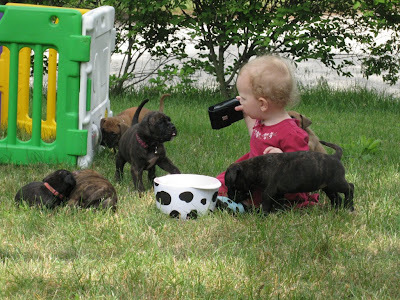 One is jumping on her, one is smelling her shoe, one wants to play with her toy, and the rest are occupied elsewhere. Too Funny! We have already been to the health club and back this morning. I am going to check movie times and we may go see the new 'Terminator' movie, or possibly the remake of 'Pelham 1-2-3'. Here's a funny on myself - if I can't read the SIGN correctly that is advertising VISION EXAMS, does that mean I NEED ONE? More than likely! When Charlie and I left the health club, we passed a swanky, Asian Fusion/Sushi place that has a reputation for being very pricey - lunch for three around $125. I mentioned that to Charlie and he said in his gruff drawl 'Well, EX-CUSE my a$$'... I don't think we'll be going there anytime soon. Have a nice rest of the day and rest up because MONDAY is almost HERE! 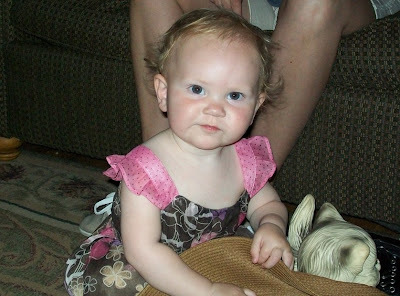 Here's a cute expression on Savannah's face while she is playing with Auntie Cheryl's straw hat. It's the weekend, and I am going to leave soon for water aerobics class - either one or two classes. Then I need to go grocery shopping, I never really shopped last week except for Sams Club. Hey - I am sick of gas prices going up! I just want to say it, and there's nothing I can do about it, but it annoys me, because the price of crude oil is not very high at the moment. Gas is around $2.59 here for regular - don't know about RI or Maine. Day 1209 - Friday - Friday - Friday! Here's a cute picture of Savannah playing in a bowl of water. 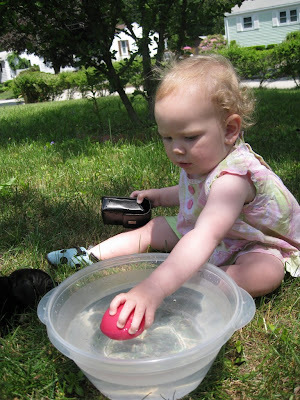 It is so fun to play in and around water, I still do it! When I was a bored youngster, I used to fill the bathroom sink with water and dunk my head in, to practice holding my breath. Charlie and I went back last night to the same Applebees we went to a week ago - the one that had very few customers. Again - we got right in. For a while we were the only customers with a table on that side of the restaurant, though I think there were a few customers at the bar. The manager came over to be sure we were happy, and we told him we had been there twice in a week and were keeping the economy afloat. He suggested several more visits. Good man. I heard on the news this morning that the big concerts at the stadium for the CMA Music Festival were delayed 2 hours last night due to thunderstorms, but then continued on. Knowing how that feels - I hope everyone had a good time! Day 1208 - Hey, it's Fan Fair Week! Remember the times we went to Fan Fair? We had fun, but the weather does make a difference, and today it is supposed to rain on everyone. My favorite Fan Fair memory is of my sister in law, when Trace Adkins walked by her. She almost fainted. 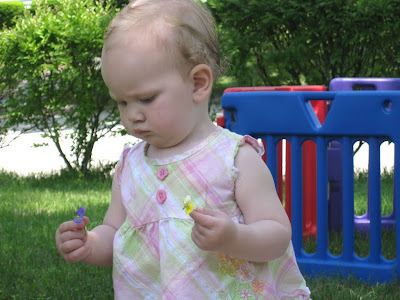 Here is a cute photo of Savannah inspecting some minature pansies. This is a great picture! Hey - I had a voice mail on my cell phone yesterday, but it wasn't for ME. It was a Happy Birthday message for my CAR. Yes, it's been 2 years now since I bought my new CR-V! Time flies! I still feel like it's a 'new car', but I will say that the rep at the car dealership made a point of saying 'Let us know if you're interested in trading and getting into a new car'. THIS IS MY NEW CAR, AND IT WILL BE MY NEW CAR FOR MANY YEARS, THANK YOU VERY MUCH. Hey - gotta go! TTFN! 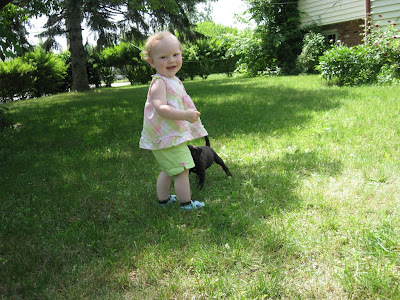 Here's another cute photo of Savannah in the yard with a puppy. Adorable, and the yard looks good too! A father and his very young son (I would say less than 3) were hanging out at the pool while mom did her workout. Dad kept up a running monologue as the son enjoyed jumping off the edge of the pool into his arms, etc. After MY swimmage, I stretched out on one of the pool loungers and enjoyed the breeze. It was late, around 5:30 or so, and the sun was dim, with a slight breeze. It felt wonderful. Charlie and I had a fun time at the annual Beekeepers Picnic (it was 90 degrees outside so it was held in a large, air conditioned Veterans hall, set up with round tables). We had Whitts BBQ and fixin's for dinner, and the attendees brought desserts. There were SO many desserts I brought back a lot of the pastries we brought for our contribution. Poor Charlie will have to eat them instead. 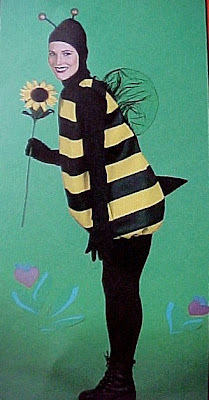 What do they DO at a bee picnic, you ask? Good question! As with any gathering of people with a common interest, you hang around, meet people, and TALK. You talk about bees, and bee strategy, and honey, and 'stuff'. All the 'new-BEEs' - people who have less experience, always want to talk about what is going well, and not as well with their bee colonies. One woman we chatted with in the food line even showed us her various stings and swellings, which sparked a conversation about bee stings being used as a curative for arthritis. Later on, they had a raffle and gave away certificates for Queen Bees, a Beekeeper suit, some gift certificates and various honey extraction equipment. Very nice! And speaking of BEEs - I won one of the table giveaways last night - a little ceramic watering can with a frog on it. Very cute. Everyone was VERY friendly and nice to us - can't wait for their Christmas banquet! Day 1205 - Monday and the Bee Picnic! 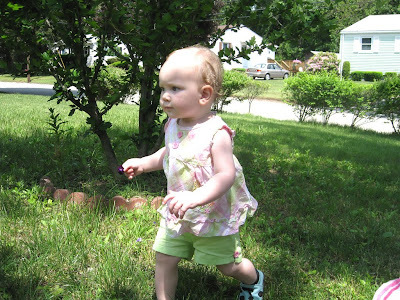 Here is Miss Savannah in action, running over to show the flower she found. I love this picture! Someone at work COMPLAINED to me that they hadn't seen Memorial Weekend photos of Savannah yet, but I can't get to photo sites at work, they are blocked. That means I need to email pictures to myself at work or burn a CD. 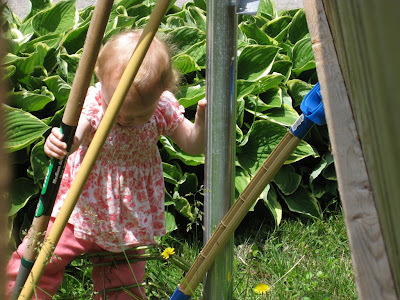 Tonight is Charlie's annual beekeepers picnic - and I don't want to miss that! We are bringing a dessert, and sorry Mom, I'm going to have to buy one at Sams Club because I don't have time to bake something! Gotta go! TTFN! Heather - love the pictures! Instead of a funny church sign - Charlie saw this on an email this week: 'If God is your co-pilot, you'd better swap seats'. This photo shows Savannah and Chaka, both very interested in the little plastic monkey I brought Savannah Memorial Weekend. The monkey plays 'Twinkle, Twinkle Little Star' when you press it's nose. 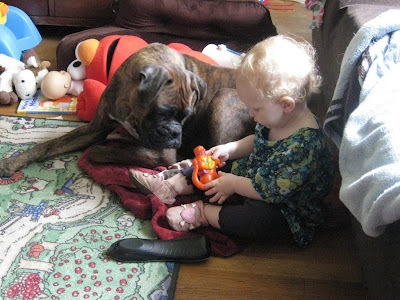 I think it's great that TWO members of the household love the toy, and they both seem equally intent! Charlie had fresh blueberries in his morning oatmeal, and I ate a few just walking by them. They are in the fridge now, waiting to be added to oatmeal, blueberry pancakes and fruit salad. Charlie and I had dinner at Applebees the day before yesterday (that would be Friday night). The one we went to is near the GM Saturn plant. On a Friday night, it would usually be busy, if not crowded. There were hardly ANY customers in the place. Nobody waiting. They sat us (party of TWO) at a big booth set for 6. There were other couples and small groups seated at some other large tables. The bar section was empty. We said to our waitress 'Where IS everybody?' She said that on Monday of this week, business just dried up. That is the very date the annoucement came out that the Spring Hill plant would go on 'idle' status. Gotta go! Have a nice Sunday and TTFN! Day 1203 - Berry Berry Good to me! 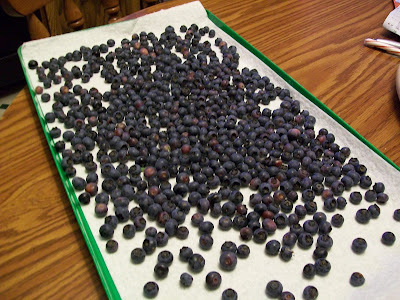 Not only did Charlie get his 100th trout this week, he picked over 100 ripe blueberries in our garden today. Can you BELIEVE blueberries already being ripe the beginning of JUNE? OMIGOSH! The rest of the garden isn't doing much, it drowned earlier this season. However, the blueberry bushes are several years old, and are doing well. Gonna head out to water aerobics this morning, then shopping and whatever else I can think of doing. It's Friday, and I am glad. Here is an 'arial view' of Miss Savi's flowery outfit. The skirt is as big as she is. Very cute. Did I mention yet that I hit the OUTDOOR pool this week at the health club? It opened Memorial Weekend while I was in New England, but I hadn't had a chance to use it. The water is already warm enough to feel comfortable. There is something about swimming outside vs. inside that I really like - the sunshine and clouds are nice additions to my 'swimmage time'. I am not tan enough (yet) to exercise outdoors at noontime - I'd burn to a crisp. But I can go after work, not get burned, and enjoy it. His new trout count is 114 for 2009. 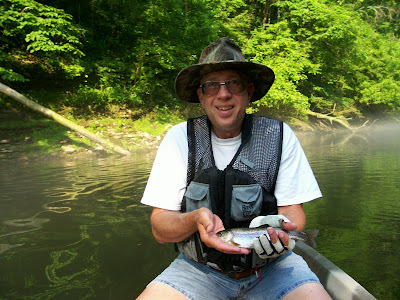 All the trout were caught on the Elk River near Lynchburg, TN (where Jack Daniels distillery is). Thanks to Blog reporter at large (TY) for taking the photo of 'Trout 100' on Charlies camera. TY (which are his initials, by the way) also beat his 100 target. Great job, guys! I have a 7am training session at work to learn about our new benefits, so I am leaving soon. TTFN, and have a nice Dr's appointment, Savi and Heather! 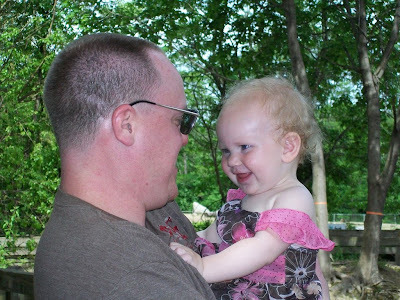 Isn't this a darling photo of Uncle Evan and Miss Savi at the zoo? She flirts with him all the time, and runs over to him whenever she sees him. SWEET! Look at her smile. It's gray and a bit rainy today, but TY and Charlie are going to trout fish anyway. Why bother on a rainy day, you ask? Because they have been keeping track of every trout they have caught this year, and they are TIED at 96 trout each. Their goal is to break 100 today. Since I said that, I might have jinxed it. If they don't get to 100, I am OK with taking the blame. By the way - they fish a lot of 'catch and release' - so those trout don't necessarily end up in the freezer. If they brought every one home I guess we'd be eating trout a lot more often! 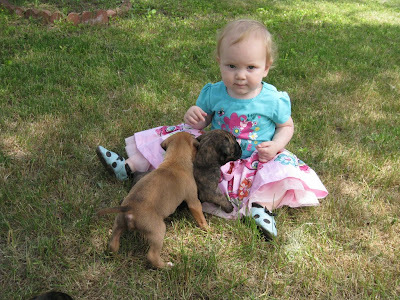 Here's a cute photo of Savi with two puppies - and look at that darling dress! Well - I don't talk much about work on the blog, but I will say that the company I have worked for these past 3 years was just acquired by a bigger company. Hopefully that will mean changes for the better, I do know that the benefits are going to be better, so maybe I won't gripe and moan so much about my lack of vacation days. Day 1198 - It's JUNE!!! Hey - it's June! I had to pay some bills yesterday. 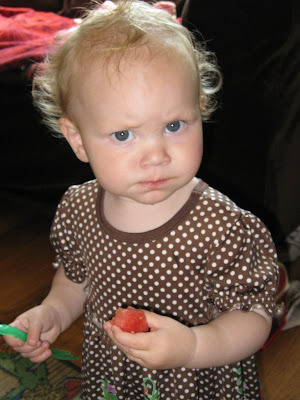 Savannah is eating watermelon with a very determined look on her face... Cute curls and cute dress! The last watermelon I bought was very good - it was from Texas, and just delicious. I always cut up the whole thing and put it into containers. This watermelon was seedless, but it was still big - it filled 3 half gallon containers and a few quart ones. I'm going to make this short - I was washing sheets and towels last night after Cheryl left, and had to let the towels keep drying after I went to bed. I just put them on 'fluff' and need to go fold them and put them away. Thanks again for coming Cheryl - we had a great time!